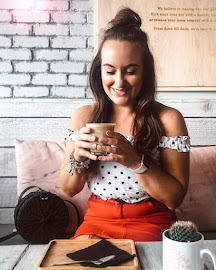 Stella and Dot is a brand that I'd never heard of before but I was very fortunate to have been asked if I wanted to review a couple of their pieces and after having a browse through their products it was a much resounding yes! The San Francisco based company Stella and Dot sell a variety of jewellery pieces such as necklaces, bracelets, rings but also bags and scarves to compliment any outfit. I was very kindly sent two of their necklaces and a bracelet to review which arrived in the most beautiful packaging that each have a little quote inside which is just so cute! The first piece that I received was this Zuni Layering Necklace which is made from semi-precious stones and freshwater pearls to create a stunning layering tribal-esque necklace. Every necklace is unique due to the variation of the stones. This necklace is also multi-purpose as seen in the photos above as not only can you wear it as a whole 3 layered necklace but you also unclip the middle tribal section to wear singular or alternatively you can wear the gold chain on it's own. The second piece that I was sent was this Alexia Fringe Statement Necklace which I personally love! It's such a delicate piece with the shiny triangles featured throughout and like the Zuni above can be worn multiple ways, it can be worn doubled up or just long. Two necklaces in one. The Alexia is also sold in silver too if you prefer. The final piece that I was sent was this gorgeous intricate gold cuff. The Grace cuff will add a touch of elegance to your outfit and can equally be worn during the day or in the evening. Stella & Dot really do sell some amazingly beautiful pieces and it is well worth having a browse through their website if you're in need of that special piece of jewellery. You are able to purchase the pieces online or alternatively you can become a stylist and host a trunk show to sell them to your friends and family. If you enjoy the pieces and are looking to make a little bit of extra money then this could be the opportunity for you. You can earn up to 25-30% sales commission, enjoy 25% discount on all products and make friends in the meantime by hosting trunk shows or attending events. You can read more about all the rewards of becoming a stylist and the role here. If you're North West based and are interested in holding your own trunk show with your friends then you can get in touch with North West independent seller Emma. What do you think of these pieces? Would you be interested in hosting your own trunk show?